This haven for families, nature lovers, painters, photographers and walkers alike is set in the scenic Glen of Aherlow area, on the Tipperary Limerick border and surrounded by the Galtee Mountains and the peaceful villages of Bansha and Galbally. The aptly named Galtee Mountains, Mountains of the Forests, form part of the Glen of Aherlow's natural border. The entrance location of its centrepiece, the Glen of Aherlow Nature Park, is close to the Christ the King statue and adjacent to the car park. This statue of Christ the King, with its upraised hand blessing the glen and all who pass by, has been part of the local scenery since 1950. Close to the entrance is a map board displaying the routes of the woodland, Bianconi and Ballinacourty Loop walking trails. 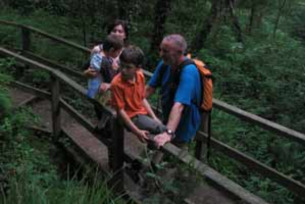 The Glen of Aherlow Nature Park is ideal for families to take a peaceful woodland ramble in and to view plants, flowers and the natural habitat of foxes, squirrels and birds. Explore the ruins of Lenihan's cottage, a typical small farmer or labourer's dwelling, which dates back to famine times, or the restored stone bridge on the old Bianconi road. Take some time to read the tranquil poems, the work of local writers, or to just listen to the woodland sounds and bird song. Nature is always at its best in the scenic Glen of Aherlow. Open daily.